Kerala High Court on Monday issued a notice to the Centre on a public interest litigation over the Ministry of External Affair’s decision to introduce orange colour jackets for passports of ‘unskilled’ workers, terming it as a violation of the fundamental right to privacy and dignity. According to media reports, a lawyer, Shamsuddeen Karunagappally along with a co-petitioner, Shajahan, who is an ECR passport holder, have filed the PIL. Both are residents of Kollam district in Kerala. A bench of acting chief justice Antony Dominic and justice Seshadri Naidu issued the notice. 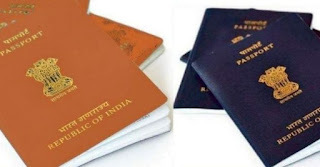 Earlier this month, the MEA had announced that it planned to stop printing the last page of the passport booklet which listed several details including address and ECR status. “As the last page of the passport would not be printed now, the passport holders with ECR status would be issued a passport with orange colour passport jacket and those with non-ECR status would continue to get a blue passport,” MEA said on January 12. The decision was criticised by opposition parties, including Congressand Left parties. Indian citizens who want to travel for employment in 17 countries are given a ECR passport if their educational qualification is less than Class 10 and have less than taxable income. According to Live Law, the PIL said that the visibility given to ECR passport holders with an orange jacket would increase discriminatory practices and also invade the privacy and dignity of the person. “The move is targeting migrant workers in Middle Eastern countries. To make their underprivileged status known publicly through separate colour code is a grave invasion of their fundamental right to privacy and dignity. There is no rational objective to be achieved through this segregation. The segregation is demeaning and shockingly violative of the principle of equality,” said the petition. As per a News 18 report, the decision not only “falls foul of the constitutional test of equality under Article 14 of the constitution of India”, but it also amounts to “hostile and unreasonable classification”. The lawyer, in his petition, pointed out that no country has made instituted “discrimination” based on educational qualifications a possibility in their passports. More than anything, he said it would increase the vulnerability of ECR passport holders, who are often targeted by recruiting agencies with false promises of employment. “There could arise situations whereby it is easily revealed to the foreign authorities that the persons is uneducated and unskilled, and by making the vulnerable state of the person so evident and apparent, chances of such persons being exploited will be increased,” the petition said.